Emily Donaldson, a doctoral student in anthropology, writes about her most recent excursion to the Marquesas, a remote group of volcanic islands located in the middle of the Pacific Ocean, where, while finalizing her thesis, she shared a four-room dwelling with a family of 11, lived on wild boar and fresh-from-the-ocean sashimi-style raw tuna, celebrated Bastille Day and dodged the occasional free-falling coconut dislodged by gusty winds. The Marquesas are a remote group of volcanic islands located in the middle of the Pacific Ocean, on the northeastern edge of French Polynesia. Rugged and tropical, they are rich with endemic species of fish, birds and plants and a culturally unique indigenous population. I came here in 2013 to conduct my doctoral research on the relationship between heritage and livelihoods for contemporary islanders. Throughout the year I lived with families in fourteen different villages on the six inhabited islands, conducting more than 350 informal interviews with islanders. The topics of discussion ranged from local politics and diet to spiritual beliefs and understandings of the past. This past July, I returned to the islands to live with my adoptive Marquesan family in the village of Vaitahu and take care of a few final thesis-related projects. The village of Vaitahu (population ca. 350) is located on Tahuata, the smallest inhabited island of the Marquesas. 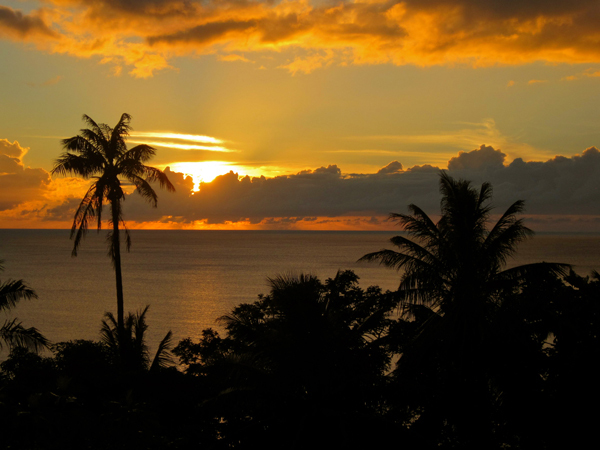 To get there you first fly to Los Angeles, where you board an eight-hour flight to Tahiti, and then take another four-hour flight to the island of Hiva Oa. After peering down at open, endless blue sea and the occasional coral atoll for almost a thousand miles, the Marquesas suddenly materialize: an enchanting surprise. As you descend through the drifting clouds the lush green mountains of Hiva Oa emerge, cutting into the sky with their sharp ridges and steep ravines. 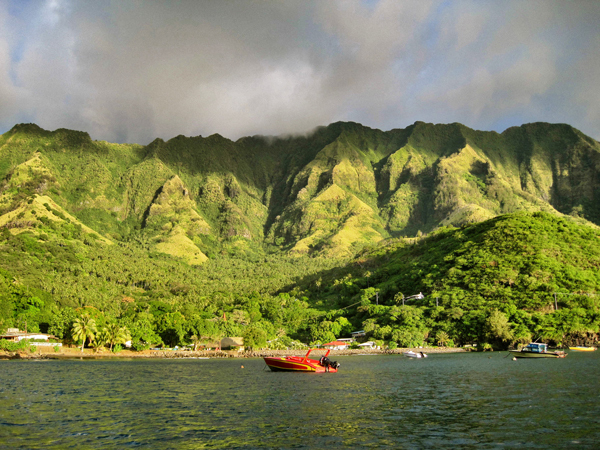 No matter how many times I visit, this moment always reminds me of why the Marquesas have attracted so many dreamers. Long before my arrival, their dramatic landscape and inhabitants had already captured the imaginations of Paul Gauguin, Jacques Brel, Robert Louis Stevenson and Herman Melville. The plane lands on a spare ribbon of black pavement nestled on the island’s central plateau. I collect my bag from the one-room Hiva Oa airport and catch a ride down the single island road, ears popping, past banana plantations and grazing horses. Once on the pier, an islander tosses my bag from the dock onto the tipping bow of a small, handmade wooden fishing boat, then I clamber aboard. The 45-minute trip to Tahuata crosses a channel exposed to the steady, sometimes looming waves of the Pacific. As we motor along, each crashing swell sends up a froth of white as it pounds the rocky coast, contrasting with the dark crags and green mountains above. If you look closely you can often see tiny white specks moving against the cliffs: wild goats. I savour the moment when we round the final corner before Vaitahu. The steep black rocks suddenly give way to a deep bay and the fresh, fragrant pressure of the mountain winds sweeping down from the back of the valley. At my family’s house I am greeted by a spread of delectable island eats. 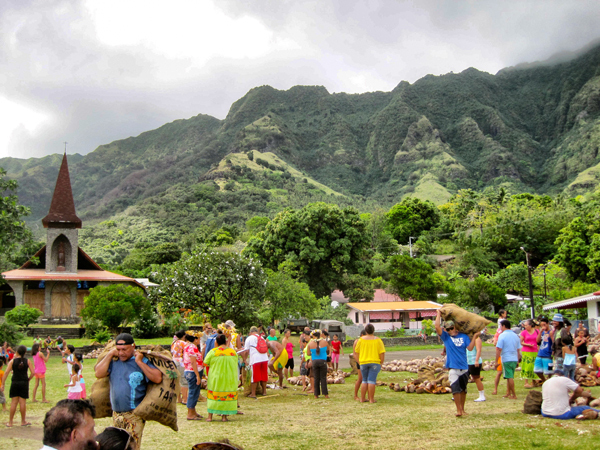 Marquesans celebrate pretty much everything with a giant feast. These kaikai ke’i typically include locally hunted pig or goat, fish, cooked bananas, plantains, several types of traditional breadfruit paste, raw crab with lime juice and garlic, raw fish salad and a banana pudding called poke. Everyone convenes around a table crowded with huge metal pots full of food, and the feasting begins. In general, the goal at any Marquesan meal is to eat as much as you possibly can, and then some. As a visitor, I am constantly encouraged to eat more: “Il faut bien manger!” In a way, you haven’t really arrived in the islands until you have stuffed your belly. The first few nights in the Marquesas require some adjusting. The house I live in is built from thin particle board and metal. Not including myself, its four rooms house eleven people ranging in age from 4 to 56 years old. Just outside my bedroom window live six dogs, countless chickens, two goats, eight cats and five pigs. The dogs keep a diligent and noisy watch for visitors or, really, anyone passing by on the road. The roosters await each dawn with equal parts vocal vigour and impatience; my host brother can actually tell time by the crowing of the roosters. Starting at 6 a.m. the household begins to stir, and loud discussions, music and laughter commence in the kitchen. I am glad to be a naturally sound sleeper. Everyday meals at my house are a bit touch and go. 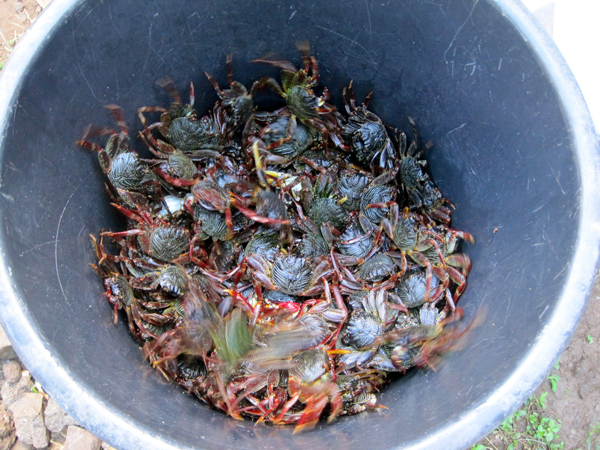 My Marquesan family rarely eats together; instead, each person seeks out food when hungry. If someone feels like cooking, he or she cooks and everyone who’s around eats, even if it happens to be 3 o’clock in the afternoon. If you miss this golden window because you’re down in the village or out visiting, then you are liable to return home to a lonely, half-eaten pork chop or fish head in the garde à manger – a Marquesan-style ant-, cat- and fly-proof food cabinet. One day I had instant coffee for breakfast, crackers and peanut butter for lunch and two pieces of chocolate cake and a mango for dinner. Luckily, those days are the exception to the rule. More typical meals feature rice with some kind of meat – either local wild boar, goat or beef, fresh fish or frozen chicken from the store. Vegetables are a rarity, but there’s plenty of tropical fruit. One of my favorite meals is warm rice with fresh-caught, sashimi-style raw tuna. My days are mostly spent working on translating Marquesan into French with my host sister, Marie. I occasionally venture down into the village to run errands or stop in at the mayor’s office, the post office or the nurse’s office. The only two stores are a classic expression of island living, stocking “everything you need” in a single room. Peanuts, glue, dishes, flour, flip-flops, Coca Cola, shampoo – if you can’t find something amidst the packed shelves, just ask the store owner. Other days, when the tide is right, we go for a swim off the town dock. The water is an impossibly bright blue-turquoise, and on the clearest days you can see straight down to the rocks thirty feet below. A moving collage of fish hovers just beneath the dock, sending up flashes of yellow, black, silver and electric blue. After having a good look with my goggles, I share them with the eager drove of village children joining us. 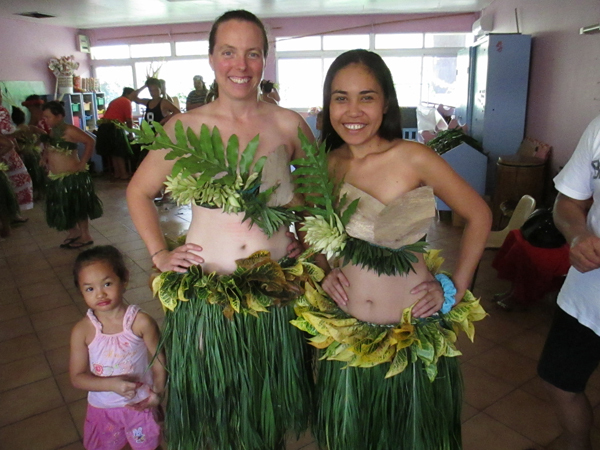 July is a month of parties throughout the Marquesas, celebrating both Bastille Day and school vacation. The festivities include coconut chopping contests, fruit-carrying races, fashion shows, kids’ games and competitions in singing and dance. Vaitahu begins its preparations for the dance competition two weeks in advance, well after the other three valleys of Tahuata. The first rehearsal is a blend of bated expectations and boredom, local teenagers yawning in their seats while the dance director nails down the final details with the chorus. Two young ladies in board shorts slap the beat on tall, wooden goat-skin drums whose sides are carved with tikis. The chant celebrates the wisdom and importance of the ancestors for today’s Marquesan youth. I have somehow been roped into participating, and feel a bit awkward singing “o matou te poi hou” (“We are the Marquesan youth”); but it’s devilishly hard to break the anthropologist’s habit of saying yes to almost any proposal! Two weeks after arriving, I take advantage of an opportunity to hike up into the valley. A single dirt road winds up the hill into the jungle from the village, following the course of a wide, rocky riverbed. Coconut, banana and lime plantations grow in the red volcanic soil on either side. We visit a number of paepae, the traditional stone platforms that were once used for house foundations, dance grounds, religious ceremonies and other activities. We also see several tikis and petroglyphs, their concentric-circle eyes staring out from the faces of cool, mossy stones. You have to be careful where you sit in the woods, since a strong gust of wind can release one of the coconuts suspended high overhead. One of the primary livelihoods in the Marquesas is harvesting copra, or dried coconut meat that is later converted into coconut oil in Tahiti. Vast plantations of swaying coconut palms blanket almost every valley, integrating the everyday activities of Marquesans with the ruins of their ancestral past. Chopping copra is slow and laborious work. The coprahculteurs first clear the land with a weed whacker, then gather the fallen coconuts into piles. Chopping them open with an axe, they remove the meat, which is collected in burlap sacks and brought down into the village and laid out to dry for at least three days. What the coprahculteurs earn from selling copra they use to pay for food, clothing, gas for their car or speedboat, their children’s educations – it is their living. The value of the historic paepae is comparatively complex, implicating everything from religion to capitalism and local politics. As I begin to write my thesis, I am challenged to capture not only how Marquesans perceive their heritage, but how they lead their lives. Thanks to the richness and vibrancy of island life, both yesterday and today, my research in the Marquesas has been a true pleasure. Emily Donaldson is a McGill doctoral student in anthropology with thirteen years of experience working in the Marquesas. When she’s in the islands she misses berries, her dog and her American family. When she’s home in the U.S. she misses her Marquesan family, fresh guavas and bountiful quantities of raw fish. Her former education includes a BA from Harvard and an MA from the University of Chicago. In between degrees she has worked as an archaeologist, museum curatorial assistant and landscape historian. 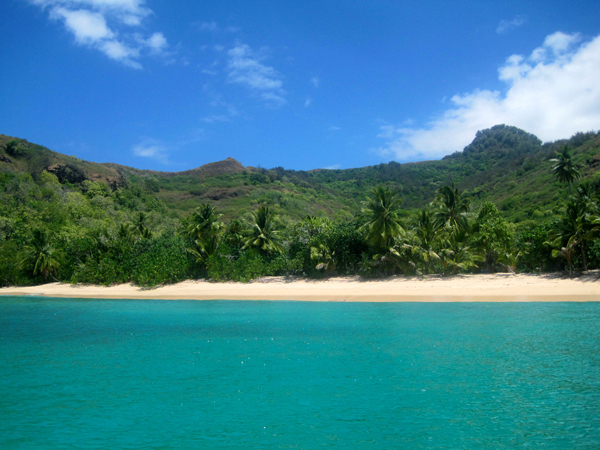 Emily, thoroughly enjoyed reading about your living, exploring, researching around Marquesas. It truly sounds amazing – very beautiful place – people too! I’mso glad Ed forwarded this to us. Blessings to you and Damien from Wisconsin! Enjoyed reading your story Emily!